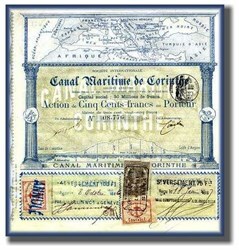 Beautifully engraved Certificate from the Societe Generale du Canal Maritime de Corinthe issued in 1886. This historic document has an ornate border around it with a vignette map of the Mediterian. This item is hand signed by the projects administrators and is over 125 years old. 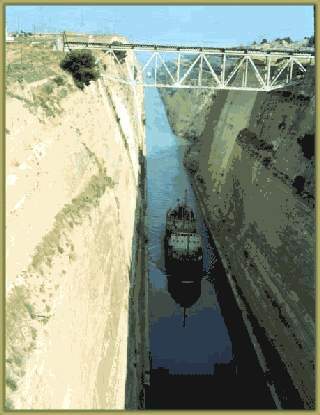 The Corinthian canal, built during the late Nineteenth Century, connected the Gulf of Corinth with the Aegean. It is only four miles in length and twenty three metres wide. It was completed between 1882 and 1893. Nero attempted the building of a canal in this place but his efforts met with failure. The canal is an amazing feat, precipitously deep, and in its few short blocks in length joins the Adriatic and the Aegean Seas. Its construction has saved the modern shipping industry from having to choose from one of two onerous alternatives: Unload all cargo and ship by rail or truck across the narrow Isthmus of Corinth and reload the cargo in another ship or sail entirely around the Achaian Peninsula, adding several days and much expense to the voyage. At one time Nero tried to cut a canal through the Corinthian isthmus. He failed in his attempt, but in 1893 a canal was cut, and ships can now go from Egypt to the Adriatic, and from the Adriatic to the Aegean through the Corinthian canal. Before that, small ships would be taken overland on rollers from port to port, while large ships had to be unloaded on one side of the isthmus and reloaded on the other side with the cargo being carried overland between the ports. No one wanted to make that additional 200 plus mile journey around southern Greece if they didn�t have to and this little strip of land where Corinth was located was an ideal solution to that problem. But, it did have one major set-back. Once a ship came to port it couldn�t cross that isthmus because there was no canal to get from the Aegean sea to the Adriatic, and vice versa. And they could almost see across this isthmus because it was only 4 miles wide at its narrowest point. What to do? Well, the best solution of course would have been to dig a canal, and in fact, Perisander in the sixth century B.C. came up with the idea, but because the technology at that time didn�t make it cost effective, it didn�t happen. So, he did the next best thing. He built a road of stone across the isthmus and gave it the name diolkos, a word which means a movable platform. It was a great idea. They would take the smaller ships and actually bring them out of the water and place them on these platforms with huge rollers and drag them from one side of the isthmus to the other. The larger ships were not as easily moved and so they would have to unload the cargo, haul it across this road and place it on another ship to continue its journey. But it was still faster and safer to do it this way then to have to sail all the way around the southern part of Greece. The Greek Corinth canal is a step child of the Panama ans Suez Canals. The leading canal designer during this period was the French builder of the Suez canal, Count Ferdinand de Lesseps. 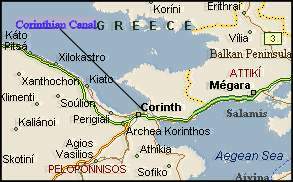 The Corinth canal links as a sea route the Corinthian and the Saronic Gulfs since 1893. Until this year, ships sailing between the Aegean and the Adriatic had to circumnavigate the Peloponnese, adding about 185 nautical miles to their voyage. The sea canal is 6,3 kilometer in length. It has a width of 24.6 meter at surface level and 21.3 meter at the sea- bed, and in some places its sides are 79 meter high. The possibility of digging a canal across the Isthmus of Corinth had, of course, been considered by the ancient Greeks. The first to look into the matter was Periander, tyrant of Corinth, who drew up a plan for a canal in 602 BC. Subsequent planners included Demetrius Poliorcetes, Julius Caesar and Caligula. These plans were later adopted by Nero, who in 67 AD announced to the spectators at the Isthmian Games that he was going to join the two seas by digging a canal through the Isthmus; indeed, he went so far as to cut the first turf himself, with a golden pick, and to carry the first basket of earth on his back. But his plans came to nothing, as did those of Herodes Atticus, the Byzantines and the Venetians in later times. The further development until the opening of the canal is based on the Panama canal activities of �Le Grand Francais" - Ferdinand de Lesseps, the builder of the Suez canal: 1876-1878 General Istvan T�rr (1825-1908) - a Hungarian, naturalized Italian and friend of Ferdinand de Lesseps - together with his brother-in-law Lieutenant Lucien Napol�on-Bonaparte Wyse explored the canal route across the Isthmus of Panama in two expeditions. The expeditions had been financed by the "Soci�t� Civile Internationale du Canal Interoc�anique du Darien", called the T�rr Syndicate. This Syndicate belonged to T�rr and Wyse, to the French banker Baron Jacques de Reinach as well as to other famous French persons. The expeditions were assisted by a young Hungarian civil engineer, a man named B�la Gerster (1850-1923). 1876 T�rr negotiated for the Syndicate with the Government of Columbia a concession agreement for ninety-nine years to build a canal across the Isthmus of Panama. The concession was payable with 750.000 French gold francs until 1882. In 1879 Wyse succeeded to sell the Panama concession for 10.000.000 French gold francs to Ferdinand de Lesseps and his COMPAGNIE UNIVERSELLE DU CANAL INTEROC�ANIQUE DE PANAMA - de Lesseps`s French Panama Canal Company. T�rr and the rest of the Syndicate realized a profit of their initial investment of more than 3.000 percent. T�rr took his money and went to Paris. In 1880 General T�rr met the Governor of the Greek National Bank, Marc R�nieri, in the German city of Aix-la-Chapelle. They discussed the possibility of the Corinth canal project. R�nieri offered T�rr the concession for this canal, based on the 1869 Corinth canal concession treaty of the Greek government. T�rr invested his money, gained with the Panama concession deal, and entrusted the engineer B�la Gerster, who had served him in Panama, with a feasibility study for such a canal cutting the countryside of Corinth. 1880 Gerster explored the route for the canal and came to a positive result. A year later he concluded with the Greek government in the name of T�rr a concession agreement for the construction of the canal (duration of the concession: 99 years, start of project within 18 months, to be completed till 1887). In 1882 a consortium under leadership of the French banker de Reinach and T�rr founded the enterprise SOCI�T� INTERNATIONALE DU CANAL MARITIME DE CORINTHE (International Corinth Sea Canal Company) with a capital stock of 30.000.000 French gold francs and domicile in Paris. The company purchased the canal concession from T�rr, subsequent he became president of the company. At this moment in France the climate for a going public of the company was favorable, because on the one side the rate of the Suez canal stocks had been jumped in dizzy heights and on the other side in Paris the speculators had to fight to get some of the 1880 new issued Panama canal stocks. In this situation it happened, that the 60,000 stock certificates of the Corinth canal company, that had been issued in May 1882, were 5 times oversubscribed. 6,000,000. French gold francs had been subscribed by Greek patriots, the rest of the shares was placed in France. King George I of Greece shortly afterwards cut the first turf to open the construction of the canal along the antique route of the Roman Emperor Nero. Gerster became chief-engineer of the canal project. 1887 2,100 laborers worked in the canal area. Financial requirements came up this year, because the group of the infamous Paris banker de Reinach treated the funds of the company very "generous". Therefore a 6% loan issue of 30,000,000 French gold francs should be floated in May 1888 at the Paris stock exchange. Unfortunately an unfavorable moment as at this time the mission of Ferdinand de Lesseps - the Panama canal project declared bankrupt. The result was the failure of this loan issue, only 10.000.000 French gold francs could be placed. Finally in February 1890 the company was insolvent. The project was stopped, 8,200,000 cubic meter earth and rocks had been digged up, 2,600,000 cubic meter still remained to do. In this critical situation 1890 Greek patriots founded in Athens the lifeboat SOCI�T� HELL�NIQUE DU CANAL DE CORINTHE (Greek Corinth Canal Company) with an equity of 5.000.000 French gold francs. The bankruptcy commissioner of the old company transferred the concession to this new company. Shareholders and bondholders of the old company received debtor warrants as compensation. The task was finally accomplished by the new company under the direction of B�la Gerster and completed in 1893. The new company was liquidated 1907 in Athens and followed by the NOUVELLE SOCI�T� DU CANAL DE CORINTHE (New Company of the Corinth canal). 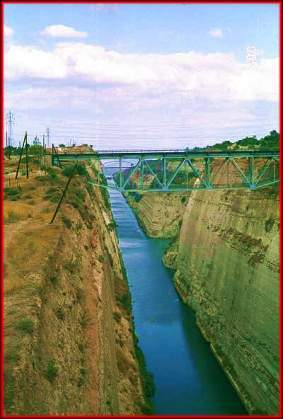 The exploitation of the Canal became property of a completely state-owned company called Corinth Canal Company, 88 Hippocratous Street, Athens in 1980. Nowadays, the Canal is being crossed by 9,000 ships per year, representing over 50 different countries.